Welcome to France. Your Suite Ship® is Ready for Boarding. Flights into Paris must arrive by 2:30 pm. Your day is free to explore the world's most romantic city before starting your cruise on the Seine. Get acquainted with the City of Lights today with some shopping, strolling, or with a croissant and café au lait to watch the world go by amid the Parisian cityscape. Monet’s Muses, Castle Courtyards, and Crêpes du Jour. Start the day with a Morning Stretch with your Avalon Adventure Host. CLASSIC Join a Guided Visit to Bizy Castle—called “Normandy’s Versailles” for its magnificent courtyard, water garden, and stables. DISCOVERY While sailing, enjoy a traditional French Luncheon of authentic French crêpes, followed by a Pastry Demonstration. This afternoon, enjoy cruising to the picturesque town of Les Andelys. Serenity on the Seine’s Most Beautiful Riverbends. ACTIVE Join a Guided Hike up to the castle ruins of Château Gaillard—historic home of King Richard the Lionheart. ACTIVE Join your Avalon Adventure Host for a Morning Jog in Normandy’s town of Caudebec. ACTIVE Explore Boucles de la Seine Normande with a Guided Hike of Normandy’s vast regional nature park in a region rich in apple, plum, pear, and cherry orchards. This afternoon, you may choose a Guided Optional Excursion to the old seaside town of Honfleur. Later enjoy live entertainment on board. Heroic Bravery on Normandy Beaches and French Farming Traditions. CLASSIC Join “A Taste of Normandy” Guided Tour for an in-depth look at this rich agricultural region. See the famous Bayeux Tapestry, visit the beautiful village of Beuvron en Auge and taste Calvados apple brandy at a local distillery. Later, enjoy live entertainment on board your ship. The Cathedral of Notre-Dame, and a Heroine for France. CLASSIC Take a Guided Walking Tour of Rouen—site of Saint Joan of Arc’s martyrdom—and see the medieval quarter with its 16th-century Astronomical Clock, and Notre-Dame Cathedral. Enjoy onboard entertainment before setting sail this evening. Walk in the Footsteps of Van Gogh, Bonaparte, and Louis XIV. CLASSIC Take a Guided Tour of the opulent Château de Malmaison—home of Napoléon Bonaparte and his wife Josephine. Perhaps, join a Guided Optional Excursion tour of the Palace of Versailles—home to a succession of French kings. Cafés, Cathedrals, & Canvases—The City of Lights Truly Shines. ACTIVE Take a Morning Walk with your Avalon Adventure Host to see Paris at first light. CLASSIC Join a Guided City Tour, that shows you the iconic sites of Paris, such as the Louvre Museum, the Arc de Triomphe, the Eiffel Tower, Opéra Garnier, and the famous Champs-Élysées. Stroll through Paris on your own, or linger over wine in a literary café on the Left Bank. Take a High-Speed Train from Paris to Dijon, to drive on to Beaune. Wine and Cheese on the Stunning Saône. DISCOVERY Later, enjoy a delicious Cheese Tasting and Wine Tasting hosted by your Master of wine. Adventures in Food and Wine in the Gastronomy Capital of France. Sail for lovely Lyon this morning for French fare. CLASSIC Join a Guided Sightseeing Tour to survey Lyon with its numerous churches from Fourvière Hill. You’ll also explore the Old Town with its maze of medieval alleyways, and the lively cafés, monuments, and famed fountain of Place des Terreaux. Spend free time biking through Lyon’s town squares, over bridges, and along the banks where the Rhône and Saône rivers meet. French Food and Wine—La Vie En Rose in Lyon. The rest of your day is free to explore, relax, or shop in France’s third largest city. Take a bike from the ship and explore local produce markets and parks, or take a leisurely tour of the city’s more than 100 murals. Later, enjoy live entertainment on board. A Rendezvous with Castle Views and Vineyards. CLASSIC Explore the pale-stone buildings of Viviers on a late afternoon Guided Walking Tour of this charming village. You’ll see its Romanesque cathedral and Old Town with a mix of historical Christian, Roman, and medieval influences. During the tour you will also discover and taste local specialties. The City of Popes in Picturesque Provence. Guided Optional Excursions include a visit to the ancient Roman aqueduct of Pont du Gard, a trip to the famed wine cellars of Châteauneuf-du-Pape for a true taste of the Rhône wine region, or a cooking class. DISCOVERY This evening, join an onboard food and wine pairing dinner hosted by your Master of Wine. Later, enjoy onboard live entertainment. Inspiring Sights and Avant-Garde Lights. Take advantage of any free time with a stop in Le Café Van Gogh for a glass of wine to relax and watch the world go by. Your cruise ends with breakfast this morning. Indulge in a culinary adventure on your European river cruise with unmatched views on the Seine, Saône, and Rhône Rivers. Enjoy special excursions and activities to highlight great regional cuisine and wine. Cruise through Burgundy and Provence to sample food and wine in Lyon and Viviers. Enjoy a pastry demonstration; a chocolate, cheese, and wine tasting; and a food-and-wine pairing dinner hosted by your Master of Wine on board. Embark in Paris and cruise to Vernon to see the home and gardens of master impressionist Claude Monet at Giverny, or visit Bizy Castle— “Normandy’s Versailles.” Sail to Caudebec for an excursion to historic Normandy. 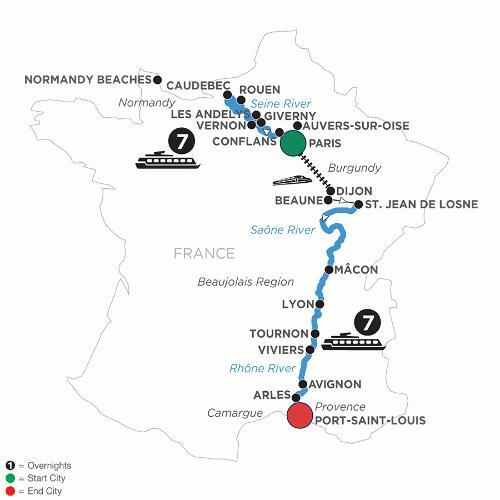 Visit the heroic WWII landing beaches of Normandy with American sites and monuments; or visit British, or Canadian memorials, or spend a day in the countryside for a “taste of Normandy.” Cruise to Rouen, site of Joan of Arc’s martyrdom, and see the sights, including Notre-Dame Cathedral. In Conflans, visit Auvers-sur-Oise, the final home of Vincent Van Gogh, or the Bonapartes’ Château de Malmaison. Your cruise continues once again in Paris with guided sightseeing in the heart of Paris— Île Saint-Louis and Notre-Dame Cathedral—or a city tour to see sites such as the Louvre, Arc de Triomphe, Eiffel Tower, Opéra Garnier, and the Champs-Élysées. In Dijon, see Van der Weyden’s “The Last Judgement,” gracing Beaune’s Hotel-Dieu Charity Hospital. Sail on the Rhône River through the Burgundy region to Mâcon with a cheese tasting on board, followed by a day of sightseeing in lovely Lyon, the gastronomic capital of France. Enjoy guided sightseeing and a culinary walk through Lyon, take a guided walk of Tournon, with its Roman ruins and fascinating 16th-century castle, and Viviers for a guided walk through this charming village, and then to Avignon. Cruise to Arles for sightseeing and a painting workshop a la Van Gogh whose work was inspired here. Your French river cruise concludes in Port-Saint-Louis. Avalon offers the opportunity for solo travelers to sail with no single supplement (subject to availability). Please call for single accommodation price. Triples not available. All prices per person based on double occupancy. Cruise price based on Category E in a deluxe outside stateroom on Indigo Deck.